There are more positive signs for the Western Australian economy with the release of today’s jobs data. 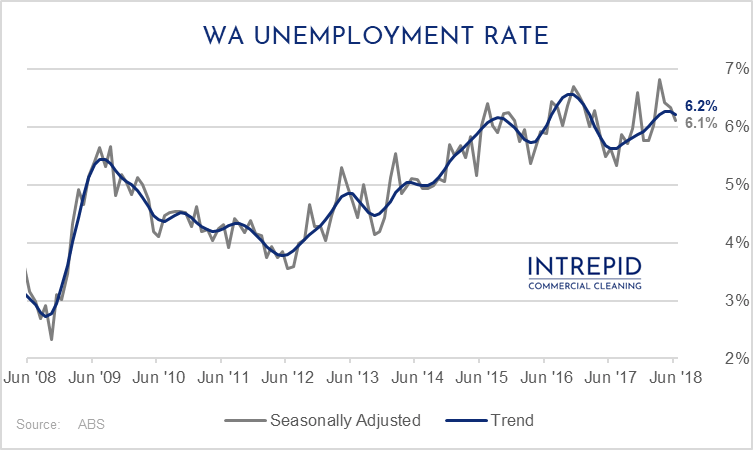 New figures from the ABS show that the WA unemployment rate is starting to trend down for the first time in 12 months, with the seasonally adjusted unemployment rate falling from 6.3% in May to 6.1% in June — which is a significant improvement from the high of 6.8% reached in March (which represented WA’s highest unemployment rate since the early 2000’s). Total number of unemployed persons in Western Australia decreased by 3,200 people during the month, which is an encouraging sign (particularly as the participation rate remained stable). For local Perth businesses, this signals more businesses are willing to hire, expand and take on more people. 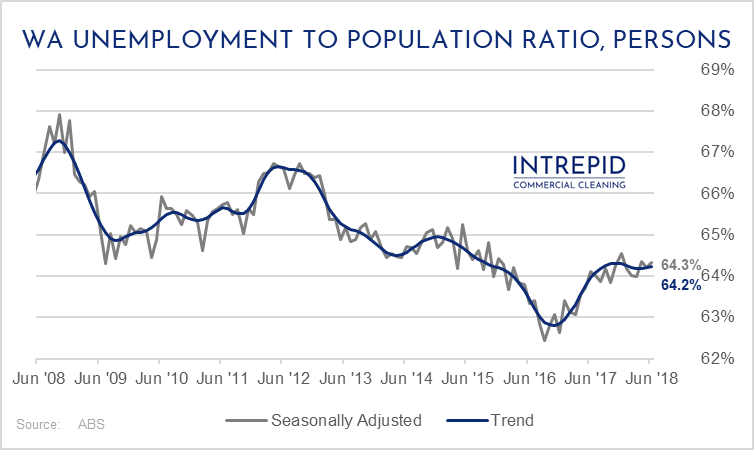 Additionally, the seasonally adjusted employment to population ratio increased by 0.1 percentage points to 64.3 per cent in June 2018 (higher than the national ratio of 62.1 per cent). This rise continues the upward trend we have been experiencing since the start of the year, see graph. Anecdotally, in our conversations with customers — who are typically small business owners themselves — there seems to be higher levels of optimism surrounding WA’s current and future business conditions. 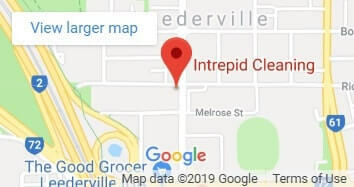 Patrick Elliott of Intrepid Cleaning said that some cleaning customers in Western Australia have expanded their offices into adjacent units or floors to deal with the flow of new work. “If you were to ask our customers how trading conditions have improved relative to just 12 months ago, most would agree that business operations have increased modestly, while business confidence has increase significantly,” Mr Elliott said. More generally, the national unemployment rate remained steady at 5.4% and there was a small (1,100 people) reduction in unemployment. Note: all figures are seasonally adjusted unless otherwise mentioned.